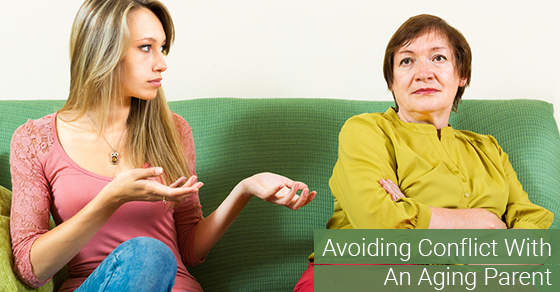 A lot of conflict can arise between people and their aging parents: this is entirely normal. When we consider that family caregivers often spend 18 hours per week caring for their parent (and potentially up to 87 hours a week for those with a parent who has dementia and is living in their home), there is a lot of time for arguments to arise. This is made much more complicated by a long line of history and unresolved conflicts, and by the role changes that occur when the caregiving roles are reversed. It can leave aging parents resistant to accept their loss of independence. You may be frightened to see your parents in this situation. While some arguments may be unavoidable, there are some ways to navigate this situation so as to limit conflict in the future. Just because you are in a caregiving role, doesn’t mean that you shouldn’t consider your parent’s point of view. It can be helpful to remember that you should always consider compromising. Approach touchy situations with caution. Perhaps the current issue at hand is that you have to take your mother’s car keys away from her. Instead of telling her that you’re taking away her keys, ask her how she is feeling about driving and if she has been having any difficulties. This allows you to approach the situation from a neutral perspective instead of from a confrontational one, which can make your parent feel less defensive. Ultimately, if you approach a touchy subject from neutral ground, your parent may be much less resistant and, in some cases, may even offer his or her own solutions. Reflexive listening is the act of repeating what someone is saying and then offering your own solution. This is a very useful tactic for escalating arguments as it allows your parents to know they are being understood. As with any argument, always remember to stay calm. If you don’t, you run the risk of escalating the argument further, which will not improve the situation. Sometimes, parents are unwilling to take advice from their children. It can be helpful to bring in a third party that your entire family trusts, such as a close family friend, to mediate the situation or to offer a fresh perspective. Unless your parent is mentally impaired and their physical safety is in danger, your parents have the right to make their own decisions, even if you don’t agree with them.